The ink stamp on pressure treated wood represents the sawmill where the lumber was processed. It also indicates the lumber grade, wood species and any other pertinent information. Though it's informative, mill stamps leave an unsightly stain on your lumber. The ink stains on pressure treated lumber are made from a water base. Eventually, the stain will disappear on its own. Rain, snow and foot traffic cause the stains to wear away over time. If you prefer not to wait for the elements to remove the ink stains, there are some cleaning methods you can try. If you are using a non-transparent paint or stain on the pressure treated wood, you don't have to worry about removing the ink stain altogether. Paint or stain as you normally would, going with wood's grain. You may need to use two coats for the stain to completely disappear. You might be able to scrub the ink stain from the wood. The ink stain can become embedded into the wood and might not come off easily. While wearing gloves, dip an abrasive sponge or steel wool in diluted bleach or Borax. Scrub the board until there's no more ink. You may need to repeat the dipping and scrubbing process several times before you don't see the stain anymore. Sanding can be an effective method of ink stain removal. Using 80-grit sandpaper, gently sand the stain. Sand in the direction of the wood's grain until there's no more ink. When the stain is gone, wipe it clean with a damp cloth to remove any sawdust. Some carpenters recommend running the wood through a planer to remove the stain and using the sandpaper to smooth away any roughness. Oxalic acid is a "wood brightener" — or bleach. Though it's normally used to remove dark spots from older wood flooring, some also use it to remove ink stamps. Because it's a strong chemical, it's best to take precautions when handling and using oxalic acid. Always wear gloves and a mask, and work in a well-ventilated area. Place a small amount of oxalic acid on a scouring sponge and rub the oxalic acid into the stain. Let the chemical sit on the stain for about 10 minutes and wipe it off with a clean damp cloth. Repeat the process as often as necessary. 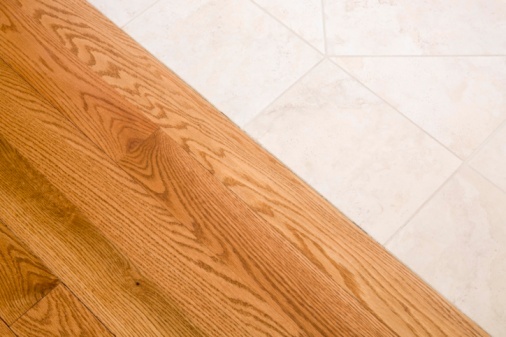 Is Acetone Safe to Clean Hardwood Floors?